Capital of the department of Aube, France. It contained a Jewish population as early as the tenth century, as is clear from a responsum addressed to the community of Troyes about the year 1000 by Judah ben Meïr ("Sire Léontin") and Eliezer ben Judah (or, more probably, Eliezer the Great, pupil of R. Gershom). Another "teshubah," sent to the same community by Joseph ben Samuel Bonfils of Limoges in the early part of the eleventh century, shows that at that time the Jews of Troyes, with the sanction of the counts of Champagne, who regarded them as an important source of revenue, owned vineyards and other real estate. At the end of the twelfth century and at the beginning of the thirteenth the counts of Champagne and the King of France entered into an agreement by which the contracting parties bound themselves to surrender to each other all Jews who should quit the domains of the one and settle in the territories of the other. In 1204 all rights over the Jews who settled in Ervy were waived by the Seigneur d'Ervy in favor of Countess Blanche of Troyes; and in 1222 Thibaud, Count of Champagne, acknowledged the receipt for 160 livres given by the Jews of the city to Jacob, "Master of the Jews of Troyes." In March, 1288, the Jewish inhabitants of Troyes were accused of a ritual murder; and on April 24 of the same year the tribunal of the Inquisition condemned to the stake thirteen Jews, whose names, according to the elegy of Jacob ben Judah on the auto da fé, were as follows: Isaac Châtelain, with his wife, two sons, and daughter-in-law, Samson Ḳadmon, Solomon or Salamin ben Vivant, Baruch d'Avirey or Baruch Ṭob 'Elem (Bonfils), Simeon of Châtillon, Jonah or "le Beau Colon," Isaac Cohen, Ḥayyim of Brinon (department of Yonne) or "le Maître de Brinon," and Ḥayyim of Chaource (department of Aube). 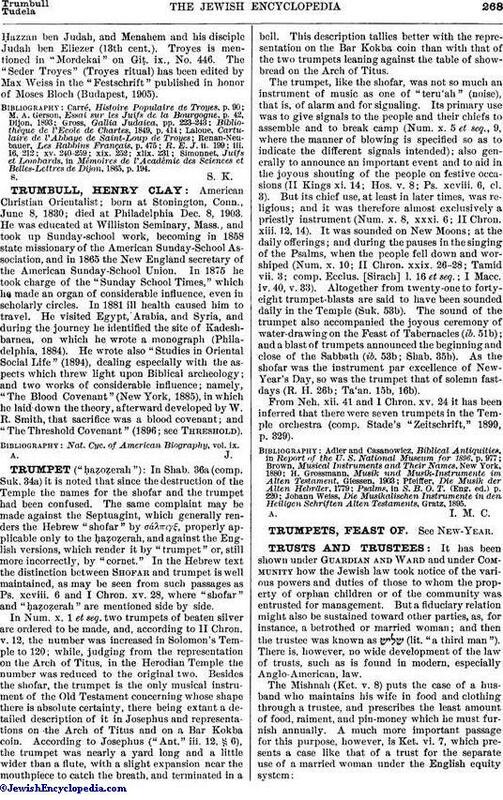 In 1298 Vivant of Troyes was one of the Jews subsidized by the treasury as an administrator for the Jews of France. The Jewish revenues from the bailiwick of Troyes indicate that at this time the Jews were very numerous throughout the country; for in 1301 their total income amounted to 1,000 livres. Prosperity reigned among them; and the seigniors of the country and the ecclesiastical dignitaries when financially embarrassed applied to them for assistance. The Jews were expelled from Troyes in 1306, but returned in great numbers in 1315. The "Document sur les Juifs du Barrois" contains the names of some who settled at Troyes during the years 1321 to 1323: Maistre Deuaye, Bonjuyf son of Bonjuyf, Bonne Vie and Domim his son, Terine, and Haquinet. In 1379 the family of Isaac Lyon of Troyes obtained as a special favor permission to reside in Burgundy. Toward the close of the fourteenth century Abraham of Treves, son of Mattithiah, and Johanan of Treves lived at Troyes. At the present day (1905) the Jewish community contains about forty families. A Hebrew school of great importance, directed by the highest rabbinical authorities and attended by numerous students from various lands, especially Germany and France, flourished at Troyes in the twelfth century. Several synods whose ordinances were adopted in foreign countries assembled at Troyes about 1160. Among the most noted scholars of the city were Rashi and his chief disciples, Simḥah of Vitry, Judah ben Nathan ( ), Joseph ben Simeon Ḳara, Shemaiah and Judah ben Abraham, Samuel ben Meïr (RaSHBaM), Jacob ben Meïr (R. Tam), Joseph ben Moses, Isaac ben Hoshaiah ha-Levi, and Simeon the Tosafist (11th and 12th cents. ), as well as JosephḤazzan ben Judah, and Menahem and his disciple Judah ben Eliezer (13th cent.). Troyes is mentioned in "Mordekai" on Giṭ. ix., No. 446. 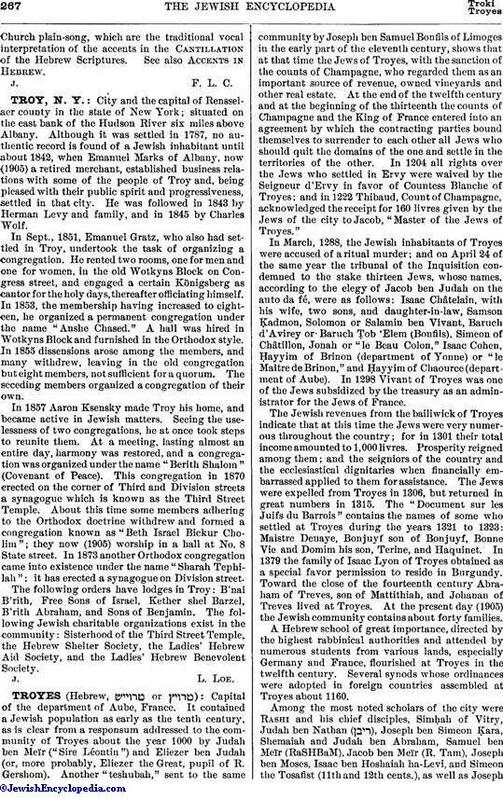 The "Seder Troyes" (Troyes ritual) has been edited by Max Weiss in the "Festschrift" published in honor of Moses Bloch (Budapest, 1905). Simonnet, Juifs et Lombards, in Mémoires de l'Académie des Sciences et Belles-Lettres de Dijon, 1865, p. 194.